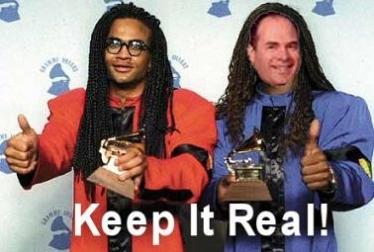 Who is the real Milli Vanilli? Sorry Scott Cleland, it’s definitely not Rock the Net. We have no problem with MoveOn, but this is a coalition founded by musicians, record labels and music fans to promote the principles of an Internet that is equally open to everyone. Cleland calls Rock the Net a “cheap publicity stunt” and implies that Rock the Net is manufactured. The sheer number of bands and music labels — more than 230 as of this afternoon — show there is nothing cheap or manufactured about the campaign. Actually, we aren’t taking it personally. The attack — as full of false information as it is — is useful in a way. It shows just how manufactured the campaign against net neutrality is. When the only negative comment we could find about Rock the Net comes from a telecom shill, it makes clear just how much support the anti-net neutrality folks have. So Scott, stop parroting the telecoms. It’s time to start keepin’ it real!